We see a lot of baby gadgets, and mostly my wife points to the door and says, “out with them.” Though there are tons of things that dad might think are cool, moms seems to have a very practical sense when it comes to the big category known as gadgets. That is not to say they can’t be wildly impractical when it comes to over-priced linens and diaper bags, but that is another story. 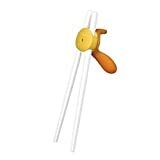 In our house, however, the Combi Chop Stick Trainer was a hit, perhaps because my wife is Korean-American, but also because it does not attempt to do something for a child, but is actually a teaching aid to teach the child to eventually use the chopsticks in the correct way. And, dads incompetent at the local Chinese restaurant, might benefit from a little practice with them as well. I love the added note Combi adds to their products: “Time spent with your baby is irreplaceable and we want to make it precious.” Well said.